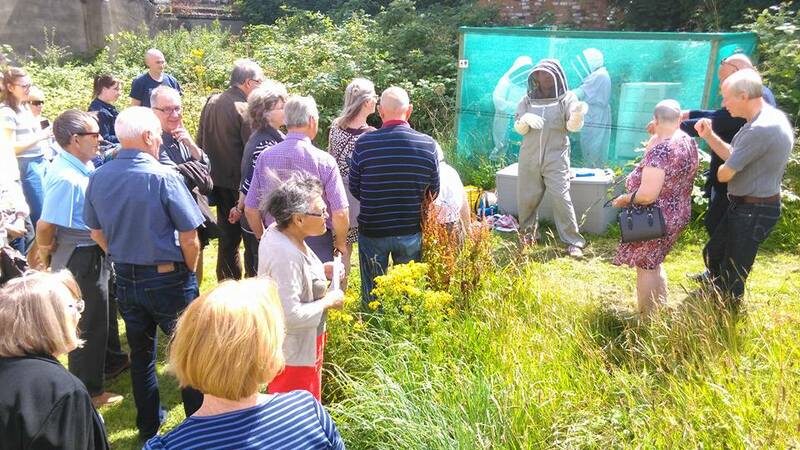 L8 Living Sustainably: Fabulous turnout for the National Garden Scheme open day! Fabulous turnout for the National Garden Scheme open day! Sunday 31 July was a fabulous day for the National Garden Scheme Open Day. Around 220 visitors came along to one if not all of the 6 local gardens and L8LS directly supported 27 local people to attend. Bee -keeping experts available all day - selling honey (a total sell-out!) and introducing people to apiary (courtesy of Martin swift and colleagues) with full demo of hive attracting lots of interest; and children's activities - thanks to Sarah McCollough. Lots of people also took info on the L8LS project and asked about the way the community garden was set up and is run (cooperatively and very informally is the answer). Special thanks to Terry Melbourne and Conal Devitt for much of the NGS day organisation. As local councillors it is a pleasure to support activity that so positively promotes our Lodge Lane and wider Greenbank area..."